Ever wish you can visit a Curtains market ? If I had a house I will definitely make my curtains funky, because they make my house stand out. 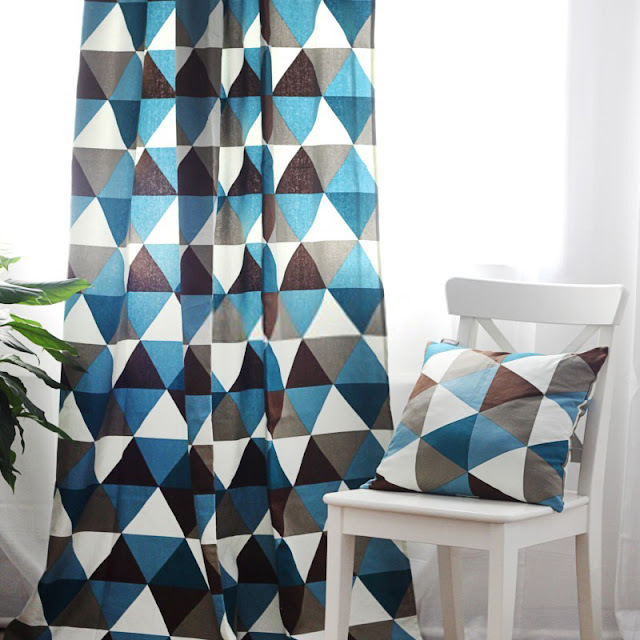 I love these Geometric Curtains most, because they're effortlessly chic and cool. Curtains are the best. Their shop has a wide range of curtains and shower curtains, we could meet a variety of house styles. I also like their red and blue curtains, and the geometric patterns are very well printed. I really like curtains because they bring light to the house, and they are so colourful. They come in all shapes and sizes, and you can totally change your house's style with different curtains. I like how a house can almost change skins with different curtains. But nothing beats bright colours (or patchwork for that matter!). I have patchwork curtains too - made mine without the backing - I lined mine afterwards. I didn't zigzag the seams and thought that might be a problem but they wash just fine. These geometric curtains are so fine, because they seem to match with almost any type of furniture. You know how every house is different? Curtains really dress up the house! Maybe I can DIY some curtains in the future to show all of you!